Facebook’s record-breaking $19bn purchase of the messaging service WhatsApp got a mixed reaction from investors on Thursday, as a sharp sell-off was followed by a rally in the social media company’s stock price. Facebook’s shares fell as much as 3.4% in early trading after the announcement of its purchase of the fast-growing and popular but thus far unprofitable WhatsApp. The news reduced Facebook’s market cap by billions. But by the end of the trading day, the shares had bounced back, erasing the earlier losses. Analysts said investors were rattled by the price – a record for an acquisition by Facebook – and the fact that the purchase was being made largely in shares, therefore diluting other shareholders. 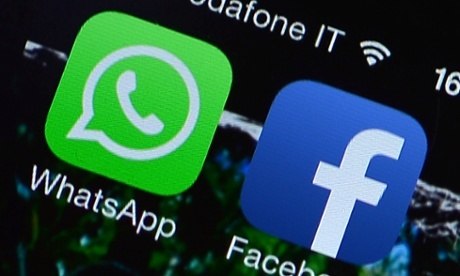 WhatsApp is receiving $4bn in cash, $12bn in Facebook shares and $3bn in restricted stock that its management will receive over the next four years. The purchase comes as tech giants fight to secure a lead in mobile technology – the fastest-growing segment for customers and advertisers. WhatsApp was reportedly courted by Google last year, and Facebook made the purchase after failing to secure a $3bn deal with the popular messaging service Snapchat last year. Peter Garnry, head of equity strategy at Saxo Bank, said: “Facebook’s technology deals are often not hinged on cash flows but more on controlling a competitor that could ultimately pose a great threat to Facebook’s dominance and market value. The deal is the largest ever made for a venture capital-backed startup, easily outstripping any tech startup purchase, including Microsoft’s $8.5bn acquisition of Skype and Google’s $3bn purchase of the ad firm DoubleClick and its $1.65bn YouTube deal. Before this, Facebook’s largest deal had been its $1bn purchase of the photo-sharing site Instagram. Wieser reduced his rating on the company’s shares from buy to hold. WhatsApp has 450 million users worldwide and is one of the most downloaded apps on several continents. The service allows people to send text and picture messages via the internet for free, avoiding texting charges. The service is free for the first year and then asks customers to pay 99¢ a year after that. Weiser said that in order to justify the price Facebook paid, WhatsApp would need to generate around $1bn in annual cash flow by 2018. “However, few data-points to support such an assumption were provided by the company, as evidently few are available,” he wrote.